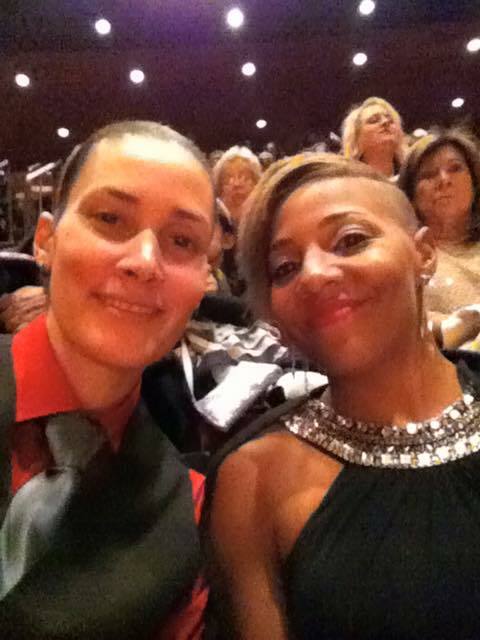 Tammy + Dominique - 2015 EnGAYged Wedding EXPO Giveaway Finalists! My name is Tammy and this is the story of how the love of my life, my fiance, Dominique and I collided and stuck together. While getting to know each other we discovered that our paths came inexplicably close to crossing several times before, but the timing wouldn't have been right and we never would have found each other the way we did or have the relationship we have now had we met at any other time. She is a dance teacher and I'm an airline pilot...our meeting had to be deliberate. Our meeting was a set up by our mutual friends, Heather and her fiance Kyra...I was the only one who didn't know that though. 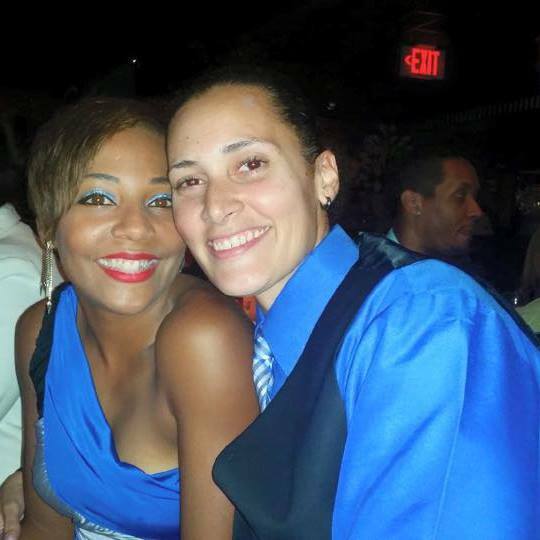 On April 13, 2014 I had made plans to go to my first Miami Pride with Heather, Kyra, and my friend Cherisse. I had gotten out of a terrible four and a half year roller coaster relationship a month and a half prior so I was adamant that I didn't want anything to do with love or relationships for a great long while. Kyra, who is a dancer, was supposed to be dancing on a float in the parade and was meeting the rest of the performers (her friends) at Pride. When we got to South Beach we met up with the rest of the group and Heather and Kyra performed the introductions. That was the moment that I met Dominique. She was the other dancer performing on the float with Kyra. I later found out that Heather had told her about me and was hoping to set us up with each other. Dominique was on crutches since she was nursing a sprained ankle (which didn't keep her from dancing on a moving vehicle, lol). While we were waiting for the float to arrive I decided to make a trip to Walgreens to get some chap stick since I had left mine at home and would be in the sun all day. She piped up that she wanted to come with Cherisse and me to the store. I said it was a long way to go on crutches (a city block) and offered to carry her. At this point I truly had no other motives than being nice to someone I just met. Thus began the piggy back day. We made our trip to the store and back and then got ready for the parade. At that point there was a bit of misunderstanding since I thought she was hitting on my friend. Now I REALLY wasn't paying attention since I thought she was into Cherisse (which she wasn't, HA). Long story short: we ALL ended up on the float in the parade, lol! Since a float ride in a parade is a one way trip, we had to walk all the way back down Ocean Drive to get through all the vendors and back to our cars. This meant that I had Dominique as a passenger all day. Again, I was just being nice. I wasn't looking for a relationship or anything even close to it. We talked and laughed all day and truly enjoyed each other's company. At the end of the afternoon we were going our separate ways to go home and I ran back to give her a frisbee I was holding for her (yes, a frisbee...free stuff at pride). She had what I thought was an "OMG, this girl is nuts....she came back to give me a frisbee!?" look on her face. Come to find out she wanted to get my number but was too shy to ask. I drove back to Heather and Kyra's house and the plan was to watch a movie. I fought for the right to go home and shower before the movie and finally they granted me permission. I only live 3 minutes away so I didn't understand what the problem was. Almost as soon as I got in the shower I got a text message from Heather asking if it was ok if Dominique came over to watch the movie with us. That's when the giant light bulb came on over my head and I understood that she had been hitting on ME all day, lol! Of course I said I thought it would be great if she came, and a short while after I got back to their house, she arrived. We sat unnecessarily close to each other on the couch and when the movie was over and the others had gone to bed, we sat up all night talking. I told her my story and how I wasn't looking for a relationship and she told me the same was true for her. She had a similar story from her most recent breakup and so she understood where I was coming from. We cuddled (yes, just cuddled) for a couple hours before her alarm went off, waking her to go to work. She then tried to put the moves on me and I shut her down with a "you know I'm not going to kiss you, right?" She said she understood and we swapped numbers and I walked her to her car. We spent the whole next day texting back and forth and then I asked her to come back down to Fort Lauderdale that night. This was no small request since she lived in Port St. Lucie, which is almost a hundred miles away. She got in her car at 9:40 pm and drove down to me. We stayed at our friends' place again, and that night we had our first kiss. We have been together ever since. I had never felt the immediate attraction and connection with another person the way that I felt it with her. She said the same was true for her and that was the reason we both couldn't shake each other. We got engaged on December 21, 2014 when I whisked her away on a surprise trip to New York that all my friends now hate me for since supposedly I made them all look bad, lol. We have our wedding date set for June 25, 2016 and we are looking for somewhere amazing and memorable to begin the next chapter of our lives together. Thank you so much for your consideration. Have a great day! "Meet" The current Finalist Couples who have entered into the 2015 EnGAYged Wedding EXPO Giveaway!